Every once in a while, I go back into my thoughts of how life was growing up. More often than anything, my thoughts go to my toys I had, owned and played with. For the most part, in the 1960’s and 1970’s, I remember very fondly the store I spent most of my time and money at: Toy City. The store I remember going to was located in Westminster, CA, in the south west corner of Brookhurst St. and Westminster Blvd. There was a set of stores and Toy City was at the very end of the row. I remember buying all sorts of toys there like Matchbox cars and Hot Wheels and later when video games and electronics were all the rage, Mattel Electronics handheld games and Electronic Battleship were what I planned on getting. I bought one of my first Slip n’ Slides there, along with Frisbees and Silly Putty and Slinkys [tangled up, I ended up buying a few over the years at under a buck each] were memorable toys. I used to scour the ads that Toy City placed in the local newspaper. They had copies of the ads hanging in each check stand. You would almost find something you wanted on sale most weeks. Going back to Matchbox cars, I remember how they came in their own boxes. I still have some today [once I find what box I have them in, I will do another retro post about Matchbox cars] that I’ve saved over the years. I’m amazed at what I’ve been able to hang onto, given how much that’s been misplaced over the years. I cherish these memories of going to the toy store because it was something I really looked forward to. I loved toys and still collect and play with some today. And it was one of the happiest times I remember about growing up. I so wish that I had pictures of the Toy City store I used to visit. It wasn’t very common of kids to get their photos taken in some random store. We didn’t carry cameras around with us. I had a paper notebook that I used to write down the toys I wanted. We called the store on the phone from home to ask if they had a certain toy. So the photos I found here were hard to locate online, but even still, brought back my many memories of my many visits to Toy City. I had so many toy and department stores I frequented as a kid. I miss them all. TRU, Target, and Walmart just can’t compare. Agreed. The big box stores don’t hold a candle to the local toy stores we frequented as kids. I have very fond memories of playing with the original Star Wars stuff in the late 70s. Used to make rebel bases in my parents front garden. Those were the days! Oh how cool. Such great memories, aren’t they? Glad to hear of those playtimes. Growing up, my mother worked at the Toy City Stores… First in Brea, (in the former Safeway, now Vons (I think) shopping center) then the huge store that opened in Fullerton at the Orangefair Mall, and later at the LaHabra store. All gone now, hell- the man who owned the stores was as I remember, already elderly more than 30 years ago. But it was cool as hell as a kid to have mom work at the toy store. That is a great story about your mom working at Toy City. I used to go to that very same store! I used to buy model cars from there, so much so, that the lady knew me well enough that she would sell me model glue to build them if I needed it. I was under age, but she knew I wasn’t using it to get high! That’s trust huh. I loved their selection and their prices, $5 would buy me a kit and some paint for it. The glue was a quarter, paint was 59 cents, the kits were between $2.88 and $3.88. They had a Clearance section and sometimes I’d luck out and find a good kit with a damaged box for half price! Thanks for sharing your Toy City memories, Patrick. I used to put together model cars. The glue used to get all over the place, but I got better at keeping it under control with each model car I built. When I was a kid in the late 70s – early 80s I sometimes would go to the Matchbox case on the far west end of the store on the front counter that they had there. Yes, they did sell them in the boxes. As I recall, you had to ask the lady to pull the car from the back of the case for you to purchase, and they would hold it there until you were ready to pay for your items. (probably due to shoplifters). I can distinctly remember seeing a lilac colored 57 Chevy with the flip front and the aqua colored 76 Firebird in there. I think I bought a red AMG Mercedes Benz 500 and a light blue Porsche 935 there. I still have them today! Never played with them, I liked them too much. Do you remember Tomy Pocket Cars? Toy city used to have a big display of them on one of the end caps at the front of the store. Same size as Matchbox and they were a buck a piece and I loved buying them because they looked so real! Or the big giant case on the east end of the store, that had the Matchbox King Size and Corgi cars in it. They were about 1/43 scale and too expensive for my childhood budget – but they were cool to look at. They were right across the isle from the model kits, so I looked at them every time I went there. I also remember the smell of the store. Walking in and feeling the cool A/C on a hot summer day and the smell of all the new plastic and cardboard boxes for the toys was sensory overload. I would just hang out there with my sister and my friends, trying to decide what we were going to spent our newly earned money on. It was one of my favorite childhood memories. Maybe you were at the store at the same time we were! that would be a small world. I wish the store was still there so I could take my kids to experience what a TOY STORE really is. Not like today where it’s just a sideline department to a bunch of other things. Even Toys R Us isn’t what it was when we were kids. Its too bad… now it’s just easier to click on a website and have it delivered to your door, rather than the wonder and awe we used to experience seeing all the great stuff we could potentially play with and it was right at your fingertips! I still have some of those Matchbox cars in the boxes (although I took them out to play with them). I tried to protect them as best as I could over the years. I bet the store I used to go to (as mentioned in the post above) is one we both were at, perhaps during the same visit. You described the very same memories I have of TOY CITY. The smell of a retail store. I also have similar smell memories of walking into a 7-Eleven with the sugar and candy aromas. 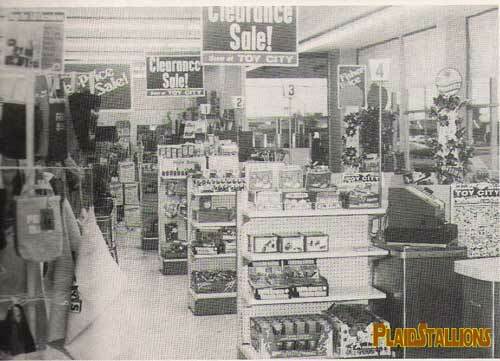 My daughter has only experienced Toys R Us and K-B-Toys, which is not the same as what we experienced in the 70’s. Thanks again for sharing your toy store memories. Very much appreciated here. Thanks for the article. I remember Toy City as well. This one from the picture is in Anaheim off of Lincoln Ave and Western in Anaheim, CA. I can tell because of the McDonalds in the window. If you’re outside of the store facing Western you’ll still see the McDonald’s is still there (newly renovated of course). A lot of people don’t remember Toy City only Toys R Us and KB toy stores since they were in all the malls. I remember because Toy City was the only store that I remember that carried the GI Joe ammo packs. No GI Joe figure just a pack that had guns, swords, anything weapons. Which as a kid I thought was cool because you can give your Joe 5 guns strapped to him lol. Definitely brings back good child hood memories of my parents taking me and my brother and sisters there as kids in the 80’s and early 90’s. You are most welcome. And thanks for identifying the Toy City location. And for sharing your Toy City experiences and memories. I was NOT a Toys R Us kid. I used to go to the same Toy City and Brookhurst and Westminster as a kid in the early-mid 80s. I didn’t know there was one in Anaheim, but I do remember my grandparents in Corona taking my brothers and me to the one down the street from them and giving us each $100 to spend in 1986. I live in Huntington Beach now, and I’m reminded of Toy City every morning when I’m sitting in the McDonald’s drive thru on Westminster, staring at the spot where it used to be. Awesome that you used to go to that same Toy City location. And $100 went a long way back in 1986.